Summary: Shandong Province E-Commerce Promotion Association 2017 Qilu E-Commerce Festival contest which held in order to establish the industry benchmark and demonstrate the power as a model, officially announced the list of winners. Jining Industrial And Information Commercial Vocational Training School was named 2017 most popular e-commerce service organization after reviewing by jury that established by experts and industry associations of colleges and universities and was invited to the upcoming 2017 Qilu E-Commerce Festival Glory Awards ceremony on December 22. Shandong Province E-Commerce Promotion Association 2017 Qilu E-Commerce Festival contest which held in order to establish the industry benchmark and demonstrate the power as a model, officially announced the list of winners. Jining Industrial And Information Commercial Vocational Training School was named 2017 most popular e-commerce service organization after reviewing by jury that established by experts and industry associations of colleges and universities and was invited to the upcoming 2017 Qilu E-Commerce Festival Glory Awards ceremony on December 22. 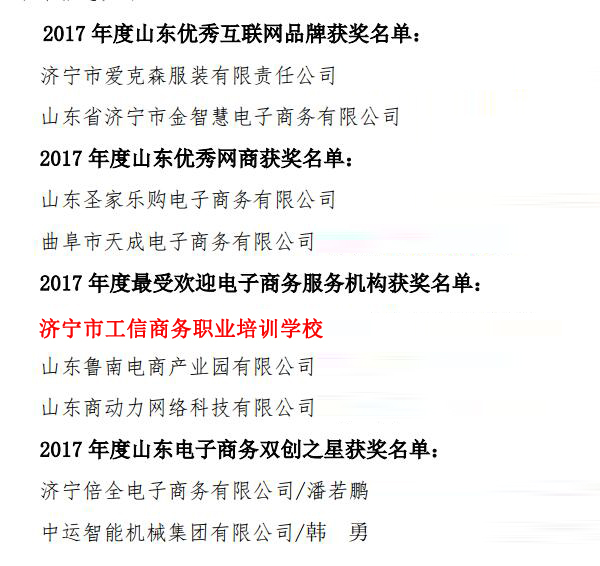 Jining Industrial And Information Commercial Vocational Training School named 2017 Year Most Popular E-Commerce Service Agency was invested by China Transport Group, for national enrollment, obtained "China People's Republic Private School Running Permit" issued by the Jining City High-tech Zone Labor and Social Security. A professional e-commerce training institutions examined and approved by Jining Municipal Civil Affairs Bureau, it also is a school that focused on e-commerce application-oriented personnel training services. Since the founding, it has been actively responding to the call of the Public entrepreneurship innovation. Based on the powerful group strength of Shandong China Transport Group and rich experience in corporate training, it has successfully held e-commerce, cross-border e-commerce, enterprise cadre management and financial management, business etiquette, business communication skills, legal knowledge and other multi-stage training courses, was warmly welcomed by all people from all industries, the impact in society is very good!